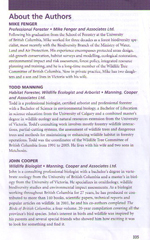 Mike Fenger is a Professional Forester, and principal of Mike Fenger and Associates Ltd. in Victoria. Following Mike�s graduation from the School of Forestry at the University of British Columbia, he worked for three decades as a forest biodiversity specialist, most recently with the Biodiversity Branch of the Ministry of Water, Land and Air Protection. His experience encompasses protected areas design, old growth conservation, habitat surveys and modeling, ecological restoration, environmental impact and risk assessment, forest policy, integrated resource planning, and training. 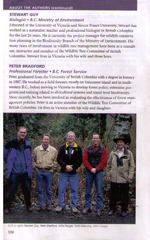 Mike was a long-time member of the provincial Wildlife Tree Committee. Mike is the contact person for ordering and information through this website.